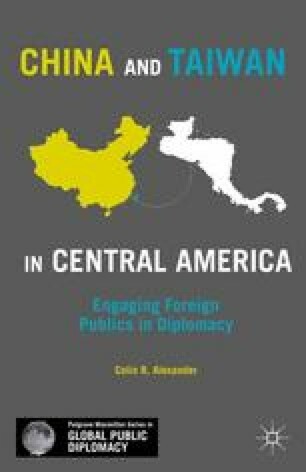 This book has used the public diplomacy framework to understand Chinese and Taiwanese public diplomacy in Central America. Much of existing scholarship around this wider topic has focused on cross-strait relations and Taiwan’s informal relations with the world’s major pow­ers (e.g., Cooper, 2003; Henckaerts, 1996; Hickey, 2007; Rawnsley, 2000 and 2005; Tsang, 2004; Tunsjo, 2008). Whereas Taiwan’s formal diplomatic relations and its presence in the underdeveloped world has a far more niche following (see Hsieh, 1985; Rich, 2009; Taylor, 1998 and 2002). What is more, much of the research on its informal rela­tions has asserted that Taiwan’s formal relationships continue largely as a result of state bribery and dollar or cheque-book diplomacy on the part of the Taiwanese. There is some truth in this, as bribery of senior politicians in return for diplomatic recognition has been documented in two of the three case studies covered here (Arriaza, 2005; El Nuevo Diario, 2005; Guatemala Times, 2010; Segnini and Herrera, 2006; Tico Times, 2004). However, as Taiwan and many of its allies consolidate their young democracies, political transparency and a less-restricted media environment have resulted in greater scrutiny of political lead­ers, making it more difficult to have a relationship based on private financial incentives. This has made bribery a far more risky tool of statecraft and one that, while able to solidify diplomatic relations, also has the potential to be the catalyst of its degradation. Thus, while older research by the likes of Gilbert (1963), Hsieh (1985), and Yu (1963) tells us that Taiwan’s use of political communications in its diplomatic allies has considerable history, these communications have arguably never been so vital to the island’s international interests as they are today.